Yoke Khin Yap.11 Apr 2019 Houghton - Two-dimensional (2D) semiconductors are promising for quantum computing and future electronics. Now, researchers can convert metallic gold into semiconductor and customize the material atom-by-atom on boron nitride nanotubes. Gold is a conductive material already widely used as interconnects in electronic devices. As electronics have gotten smaller and more powerful, the semiconducting materials involved have also shrunk. However, computers have gotten about as small as they can with existing designs - to break the barrier, researchers dive into the physics underlying quantum computing and the unusual behaviours of gold in quantum mechanics. Researchers can convert gold into semiconducting quantum dots made of a single layer of atoms. Their energy gap, or bandgap, is formed by the quantum confinement - a quantum effect when materials behave like atoms as their sizes get so small approaching the molecular scale. These 2D gold quantum dots can be used for electronics with a bandgap that is tunable atom-by-atom. Making the dots with monolayer of atoms is tricky and the bigger challenge is customizing their properties. When laid out on boron nitride nanotubes, researchers from Michigan Technological University have found that they can get gold quantum dots to do the near-impossible. The mechanisms behind getting gold dots to clump atom-by-atom is the focus of their new paper, recently published in ACS Nano . Yoke Khin Yap, professor of physics at Michigan Tech, led the study. He explains that the behavior his team observed - atomic-level manipulation of gold quantum dots - can be seen with a scanning transmission electron microscope (STEM). The STEM's high-powered beam of electrons enables researchers like Yap to watch atomic movement in real-time and the view reveals how gold atoms interact with the surface of boron nitride nanotubes. Basically, the gold atoms glide along the surface of the nanotubes and, they stabilize in a hover just above the hexagon honeycomb of the boron nitride nanotubes. "The surface of boron nitride nanotubes are atomically smooth, there are no defects on the surface, it's a neatly arranged honeycomb", Yoke Khin Yap stated, adding that the nanotubes are chemically inert and there is no physical bond between the nanotubes and gold atoms. "It's much like skiing: You can't ski on a bumpy and sticky hill with no snow, ideal conditions make it much better. The smooth surface of the nanotubes is like fresh powder." "This is a dream nanotechnology", Yoke Khin Yap stated. "It is a molecular-scale technology tunable by atom with an ideal bandgap in the visible light spectra. There is a lot of promise in electronic and optical devices." This work was performed in collaboration Ravindra Pandey, professor of physics at Michigan tech, whose team contributed the theoretical model, and Juan-Carlos Idrobo, scientist at the Center for Nanophase Materials Sciences at Oak Ridge National Laboratory. Gold atoms ski along the surface of boron nitride nanotubes. 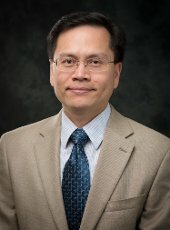 Better understanding this phenomena, using detailed atomic images from a scanning electron microscope (STEM), could help physicists, materials scientists, and computer engineers develop better computers, cell phones, wearable devices, and other electronics. Credit: Nicole Kelly/Michigan Tech.